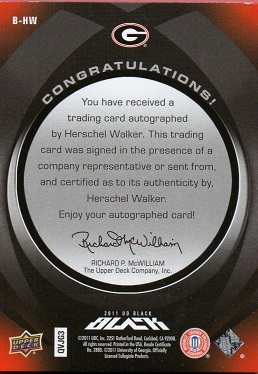 Just added this 2011 Upper Deck Exquisite Black Signatures card of Herschel to the Hoard. 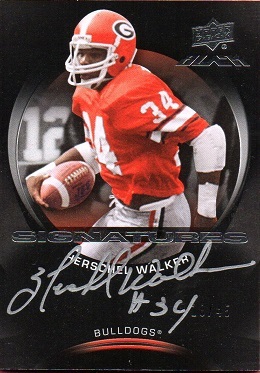 I really like the red of the Georgia uni against the black background, and the card has a nice, sharp signature. This card is serial numbered to 45, with this example being 18. It's kind of hard to see, but the serial number is just to the right of the #34 in the autograph. I actually cracked this out of a Beckett holder. The reason is that I keep my cards raw in toploaders, for the most part, and also, I wanted to upload the card to the TCDB. Congrats on the new pickup. Sweet Herschel auto. How many unique auto's of Herschel does this one make? I honestly haven't counted, Anthony. But I'm guessing it's upwards of 35. I just ordered a toploader binder, and when it comes, I'll put the autos' in it, and figure out the total. I never even knew those existed. I just looked them up on eBay. They look pretty cool. Let me know how you like it, when you get yours. If you like it I might get one myself.